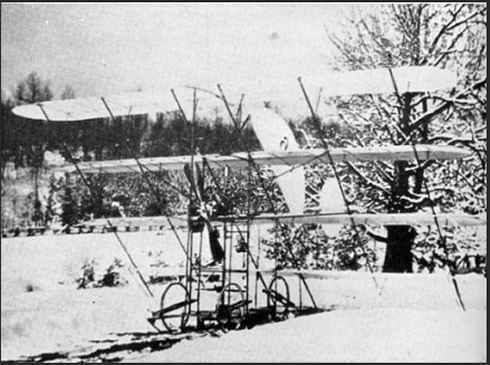 Photo from collection of Mike Banks, 9-13-04 "Personal aircraft - Dec 28, 1908 - Matthew Sellers made several flights with his quadraplane powered by an 8hp Dutheil-Chalmers motor, our nation's first civil airplane designed and advertised for personal use." I am Barbara Sellers, the granddaughter of Matthew Bacon Sellers II. My father is John C. Sellers, who is now 86 years old and in good health. My uncle Matt died a few years ago. I am wondering who you are? I am in the process of publishing a book on my grandfather, as I feel his spirit within me all the time, as I am so fascinated with flight!! I have received from the Museum in Kentucky, all the lab notes, diaries, 100 pictures on CD that my father and uncle originally donated to the Smithsonian to Edward Peck back in 1967. They have been so helpful. They scanned everything for me in high resolution and I have been working with historian and professor Dennis Sparks. I have emailed American Scientific to have them mail me the article from 1906 that my grandfather wrote. So far I am at about 400 pages of history. I have talked to several publishers and this is all new to me, so my father and I will negotiate something. But I feel there are tons of books on the Wright Brothers, but none on my grandpa. AND THERE SHOULD BE!! The museum is also sending me two audio tapes of recorded interviews with my dad and uncle back in 69 to 71. This will help my father remember some of the stuff. He has a good memory of the years after my grandpa had that accident and nearly lost his arm, and how he met my grandma. He also had a fascination with radios and my dad said growing up in Ardsley on the Hudson they were the only ones with a radio, as my grandpa made one. Very interested in learning who you are, as I saw the nice site you did. My name is Jan Westerink and I live in the Netherlands. I spend a lot of time building replica’s of historical kites and I write articles about them in kite magazine’s. Some time ago, when searching the patent databases, I found a copy of a kite of Mr. Sellers. It came to me as a sympathetic kite. So I decided to build a replica according to the patent. On the weekend of April 26, 2008, I attended a meeting at the Zeppelin Museum Friedrichshafen in Germany with fifty other historical kite builders. The Monday following that weekend was 100 years after Mr. 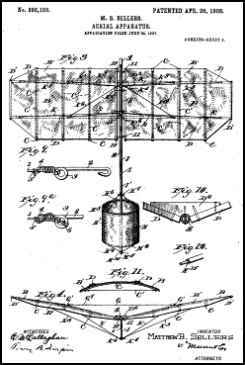 Seller's kite was patented. The meeting seemed to me to be the perfect occasion on which to present a replica of the kite to my friends and to tell them something about it. I was very surprised to find many links to Mr. Matthew B. Sellers, but no pictures or detailed information about his kites. Usually I only build patented kites from the information documented on the patent, but now it appears that it may be possible to find something more. I discovered that a family member had started to write a book about him. It may be that the book has been completed and may even be available for purchase. I wonder if it might be possible to get information in some other way? Of course, I will share all that I learn with you! I filmed and interviewed Mary Lee Mauk when she was 104 years old. She stayed with the Sellers and gave me some information. The man who was killed by the propeller was a man by the name of "Link" Binion. The Sellers had a horse by the name of "Bird". Also, I taught Technical Education at West Carter Middle School and for several years in the Spring of the year we would host a Matthew Sellers Day where the children made unusual kite designs. Once we fashioned one after the quadraplane and it created so much lift that it would lift you off the ground. We also built scale models of the plane out of wood. Years ago, a man gave me an unofficial guided tour of Blakemore. It was fascinating. In the bookshelf were letters of communication to the Wright Brothers. Editor's Note: Be sure to scroll down to the second "Online Resources" section for more information on Mary Lee Mauk and her uncle, Link Binion.